A 1955 graduate of Beaver Falls High School, Jim played football for the Tigers and earned honors as a pass receiver and defensive standout. He then attended Geneva College where he continued to earn honors as a pass receiver for the Golden Tornados. Following his graduation from Geneva in 1960, Jim began his long teaching and coaching career at Rochester High School. He taught social studies and driver’s education at Rochester High School during a teaching career that spanned 46 years. He was an assistant football coach for seven seasons before becoming a successful head football coach, a position he held from 1968 to 1981. After ten years as an assistant track coach at Rochester, Jim became head coach in 1970. For three years of that time, he coached both the boys’ and the girls’ teams. His boys’ track teams at Rochester were WPIAL champions in 1972 and PIAA state runners-up in 1986. Jim also served as Rochester High School’s athletic director for more than eighteen years. Not many high school coaches have the distinction of serving two different schools in two different sports at the same time, but Jim Ebersberger did. 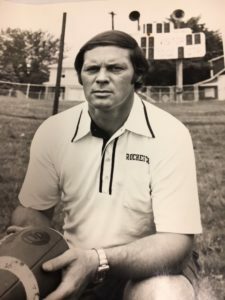 When the WPIAL made it legal for teachers at one school to coach at another, Jim served as assistant head football coach and defensive coordinator at Beaver Falls High School from 1982 to 1988, which included the undefeated 1984 WPIAL champion Tigers. During those same years he was head track coach at Rochester High School. In 1990 he was inducted into the Beaver County Sports Hall of Fame.